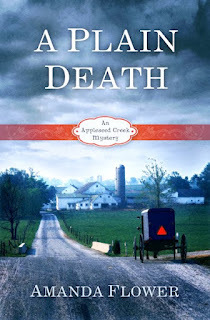 Author Amanda Flower Interviews Police Chief Greta Rose from her Amish Mystery Novel, A Plain Death. Interviewer’s notes: Chief Greta Rose is a petite woman in her thirties, who wears her hair is short bouncy brown curls, and she has bright green eyes. She looks more like a second grade teacher than a cop. Chief Rose: You know that I can read upside down. Second grade teacher? Give me a break. (pats holster) Does a second grade teacher pack heat? Amanda (red-faced): Let’s jump into the interview then. Amanda: Thanks for sitting down for this interview Chief Rose. I know you have been very busy lately. Chief Rose: I have. The atmosphere of Appleseed Creek has changed over the last several months. Chief Rose: In the past the Amish and English in Appleseed Creek have been able to live quietly side-by-side, but lately, that’s not the case. Chief Rose: Someone has been harassing the Amish. Whoever is doing this wants them out of Knox County, Ohio. Amanda: What are they doing? Chief Rose: Ruining crops, firing shotguns off in the middle of the night, and letting livestock out of their pens. Amanda: Are crimes against the Amish unusual? Chief Rose:I’ve been the chief here for seven years, and I’ve never seen anything like it. Occasionally, I’ve had to deal with rowdy undergrads from Harshberger College or a fight at the livestock sale. I’ve never seen a rash of crimes against the Amish though. Amanda: Why would someone target them? Chief Rose (rolls eyes): If I knew that, do you think I would be sitting here talking to you? I’d be out arresting people. My favorite sound in the world is handcuffs cackling on a perp’s wrists. I think I would know the motive much sooner if I didn’t have complications. Chief Rose: Chloe Humphrey, this twenty-four-year-old girl from Cleveland, thinks she can get to the bottom of what’s going on. 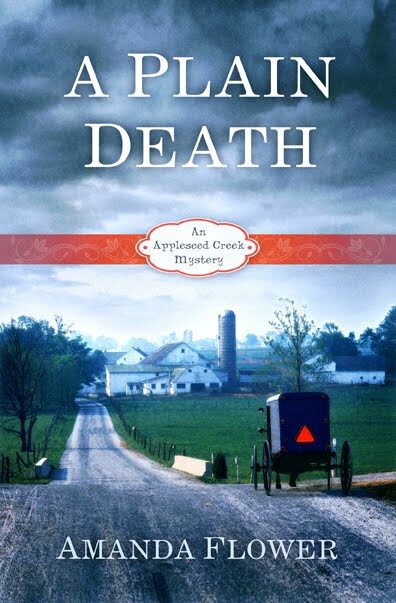 I have to admit, she’s only been here a few days and already has gotten closer to the Amish district in Appleseed Creek than I have, and I’ve lived here my entire life. Amanda: What do you think about Chloe? Chief Rose: She’s a nice enough girl. Very smart. But she’s one of those crusader types, trying to right the world’s wrong. Those types of people can become a headache for law enforcement. Amanda: Back to the crimes against the Amish, do you have a suspect? Amanda (leaning forward): Who is it? Chief Rose: Now, why would I tell you that? If I tell you here, no one will read the book, and if no one reads the book, what will happen to me? Amanda: I want them to read the book too. Chief Rose (shakes head): Of course you do. That is the point, isn’t it? Nothing wrong with someone who wants to right the world's wrongs... especially not when so many won't even try to fix what they can! Sounds like you might make a good sleuthing team with Chloe, Chief Rose. I know...cops don't like to work with civilians but you do like to make the right arrest, right? I admire you, Chief Rose. Good talking with you today!